Michigan marriage records since 1867 are available, for a fee, and with proper photo identification. Some of the records (especially those from before 1926) were not filed with the state. Copies of records may also be obtained from the County Clerk in the county where the license was issued. 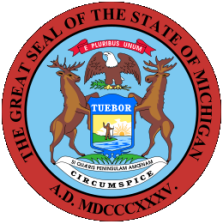 Michigan divorce records since 1897 are available, for a fee, and with proper photo identification. Some of the records (especially those from before 1924) were not filed with the state. Copies of divorce records may also be obtained from the County Clerk in the county where the divorce was granted. Requests for Michigan vital records can be made in person and by mail payable by cash or by personal check or money order payable to State of Michigan. Record Access Requirements: Records are open to the public. There is no bride index for the years 1950 thru 1975. Record Access Requirements: Records are not restricted. There are no divorce records for Detroit for 1973 and 1974. There is no "wife index" available prior to 1978. Note: No trial court records are available from this agency. Note: All felonies and serious misdemeanors that are punishable by over 93 days are required to be reported to the state repository by law enforcement agencies, prosecutors, and courts in all 83 Michigan counties. Record Access Requirements: Address questions to msp-crd-crimhelp@michigan.gov. Record Access Requirements: Almost complete computer records go back to 1981. Computer records prior to that year become less complete the further back you search. Search Note: Location, MDOC number, conviction and sentencing information, physical identifiers, and release dates are provided.